With those words, Elton Letang, 37, from Giraudel, Dominica, will profess his final vows as a Redemptorist August 7 during a Mass in Newtown, Dominica. Having grown up in a Redemptorist parish, joining the community was easy once he made the decision. 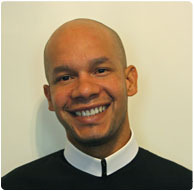 Elton is scheduled to be ordained a deacon in October, and looks forward to priesthood ordination in early 2013. Stay tuned to redemptorists.net or to our Facebook page for photos!